When Antigone (Juliette Binoche) enters, the projection appears to be a desert landscape. Here in a starkly lit, empty set in this nameless location we can believe in a prehistory where societies still believe in the laws of god and that obligations towards the dead take precedence over other moral imperatives. This is soon contrasted by the arrival of Kreon (Patrick O’Kane) and the return to Thebes. It is a deliberately separate world to that conjured by Binoche’s Antigone. Tal Yarden’s video projections switch to a wintry world where blurry figures move in and out of focus. On the surface it is a neutral scene but there is an underlying bleakness that acts as a counter-balance to the urbane Kreon’s disarmingly mellifluous voice – a constant reminder that Thebes is a city that has just come out of a brutal civil war that pitted brother against brother. It is the impossibility of reconciliation between the traditions of a prehistorical world (as understood by Antigone) and the demands of securing a modern democracy (as understood by Kreon) that drives the central tragedy. Hegel was undoubtedly right when he argued that the continuing fascination of the play is that it does not present a binary choice between good and evil, but instead forces a binary choice between two different presentations of ‘good’. Kreon delineates every moral judgement between those that do and do not threaten the safety of his city. He stated that Polynices threatened the state therefore he cannot be honoured through burial, and anyone choosing to do so must be unjust and the enemy of the city. Antigone has tighter dividing line; her obligations to her family and loved ones on one side, and all other commitments on the other. Both characters cling to the sanctity of their moral order and lack the capacity to bring compromise to their judgements; they are intractable in the superiority of their position, and the lines are marked so clearly that there is no possibility of common ground. Sophocles’ play can be seen as a call towards the importance of practical wisdom to manage moral conundrums. Both fates are inevitable as each character has an implacable value system across which compromise cannot be bridged, and as a result we find Antigone dead and Kreon without wife and child by the play’s end. In van Hove’s production the character who emerges to take centre stage is Ismende (Kirsty Bushall). She appears the embodiment of practical wisdom and must suffer the indignities heaped upon her by Antigone when she attempts to join her pleading to Kreon, but in reality what we see is a conciliatory figure who is trying to broker a familial and civil peace between two warring factions. It is a striking performance from Kirsty Bushall that brings to life a character that often seems to exists on the fringes of the action. Bushall’s Isemende is far more proactive and appears as someone who is able to understand the legitimacy of both moral arguments. Van Hove is capable of directing equally well on the macro and the micro scale. The play has a vast, epic quality that is a complete contrast with the intimacy of View From The Bridge’s tragedy. A beautiful opening scene between Ismende and Antigone sets the tone; their gestures caught by lighting so they form shadow puppets against the vast projection – bringing clarity to their movement and hinting towards the classical figures that decorate ancient pottery. The actors’ speech is amplified which is a slightly disconcerting experience for the theatre but on reflection it works quite effectively as a distancing effect. The characters we are watching are not so much Kreon and Antigone but universal archetypes that are portrayed through them. The play is supported through Anne Carson’s translation. Carson creates an Antigone that is distinct but avoids it seeming to authorial (the criticism that could easily be levelled at Ben Power’s Medea at the National). Critics may justly argue that it has lost some of the poetics but it finds clear threads through the action and there is a genuine humour that can often be lost in more po-faced versions. The language is modern but there is a very careful choice of words and few obvious anachronisms (although using the word ‘fatherland’ is a noticeably clunky moment). In particular she allows Kreon room to be a very modern ruler. There is more of a hint of the suave politician – well-versed in the language of leadership – in Patrick O’Kane’s performance but we also get a clear sense, well drawn out in his scenes with the Messenger, that there is a cold steeliness underpinning his languid delivery. After a play as successful as View From The Bridge it was always going to be difficult for van Hove to meet expectations. Antigone is not the same kind of masterpiece. However it is the best of the recent revivals of the Greek tragedies. It doesn’t rely on a dominating central performance from Juliet Binoche but has realised the benefit of making it more of a three-hander by balancing the moral weight between Kreon, Antigone and Ismende. 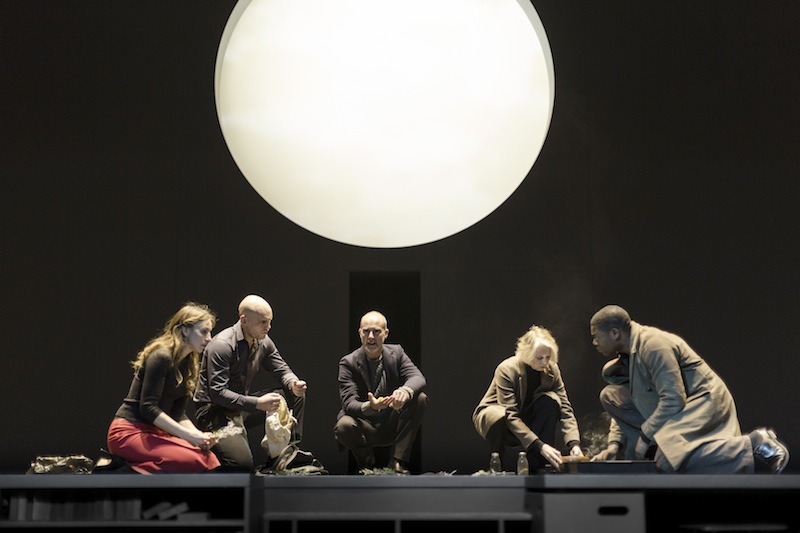 Supported by his technical team, Ivo van Hove has demonstrated that he is capable of finding life in a classic work and bringing it to the surface through clear, concise direction that marries an articulate vision with sympathetic performances. Another impressive achievement.